Got the dog themed sheets. So fun! Good quality too. Express your playful side with the 100-percent cotton percale sheet set from Taylor & Olive. Available in all sizes from twin to king, this set has a 200-thread-count that is soft to the touch and brings personality to your design. Percale sheets of cotton are always better; feels soft and thick. Forget the thread count, always go to cotton and percale for a higher quality sheet. I am very very very fussy about my sheets... they must be crisp and cool and pretty. These sheets met every criteria. The price was great, too. Would definitely buy these again. I was looking for some blush-colored accessories for our bedroom and these are acceptable but are they are more of a peach color despite the item listing calling them pink. The four-star rating is not due to the color but due to the fabric. These are not the cool, crisp percale I was looking for. There is no crispness nor coolness but they are 100% cotton, so . . . there is that. Finally a crisp cotton sheet, I have had real trouble finding sheets that I like the feel of for my king bed, these fit the bill. I dislike mirco fiber with a passion, so I am glad to find a company that is still doing cotton. love the pattern too, wish they still had the dogs. I was pleasantly surprised with these sheets. They are generously sized and the pillowcases are not skimpy. I bought the pattern with the little foxes on it, and it is very cute for the guestroom. 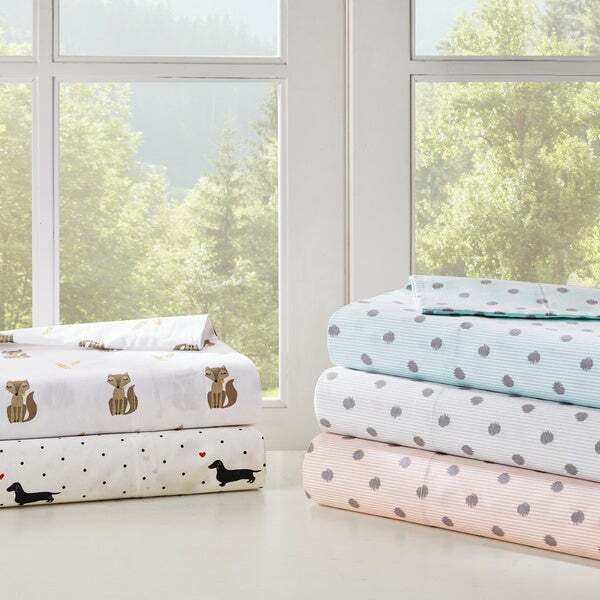 They are not super thick sheets, but they are thick enough for spring and summer, and they look as cute as any expensive sheet I’ve seen anywhere. Ordered the cute grey dots... I am thrilled with the way they (cold water) washed. Fit perfect on my mattress. I didn't take a zoom look on the sheets so I was surprised to see adorable pin striping to contrast the dots. 100% cotton was a factor in my purchase. They have a nice crisp feel but I believe in time they will soften. I would purchase again and recommend. Love these sweet sheets. If you are a doxie fan you will too. They are soft but not silky soft. They will soften with age I'm sure. I bought the matching shower curtain which brings a bit of whimsy to our bath. The shower curtain is a linen color in the background color and the little black doxies stand out with an occasional red heart throughout. Match it with the bath rug and have the complete set. We bought the little black dog print in these sheets and they're really fun and adorable! They're comfortable also! We like these sheets a lot and are happy with ordered them! Recommend! I ordered the doggy print sheets in a queen size, cream color. They are very soft microfiber material, fit the bed nicely and match the comforter set I ordered previously from the same line. The sheets wash well and do not shrink. I purchased the pink/grey dot cotton sheets for my granddaughter's trundle bed. They're so cute. Washed/dried beautifully. I got these for the beds my granddaughters use, and they are adorable and comfortable. These are seriously the cutest sheets EVER! This cotton sheet is very comfortable. I love so many cute foxes on my kid's bed. He likes it very much as well. I am not regretful for this buying. crisp and cool sheets in great colors. They are ample for oversized mattresses and wash and dry well. Super Cute! Will make a great Christmas gift. I got these cute sheets a few days ago and I love them! I got the doxies. They're perfect for the dog lover. They are soft and cozy on my bed. The gussets are large enough to fit my deep mattress and stay on the bed. Very happy with my purchase. These sheets are super cute with the peach and grays. Love the polka dots. I purchased to go with a new bedding set and the peach colors compliment one another. Very nice set. Perfect match for new polka dot chenille duvet set. Has very good feel and looks to provide long term use. Very pleased with purchase! "How do they wash up? Are the cases very wrinkled? .... love cotton, though"
Yes, wash on cold and gentle. They wash up great. I bought 2 patterns last year and still love them. The top sheet sometimes wrinkles on the finished end and the pillow cases the same but not too wrinkly. The thickness of the sheets and the finish make them well worth a few wrinkles. I've had high quality percale sheets in the past and I think this is just a hallmark of percale sheets. I would highly recommend these sheets and would buy more if I needed them! "I don't have the very thick mattress and am looking for sheets that are not deep pockets, no matter what sheets I buy they are too big, I have a king size bed and wonder if I should just order queen size, so confused and unhappy"
Don't order Queen. They are not the same size. Try to measure your mattress and then look at measurements of new sheets. You can also try putting a thick type mattress cover on it and that will take up more towards the deepness. What is the measurement of the depth of the pockets? Thanks.